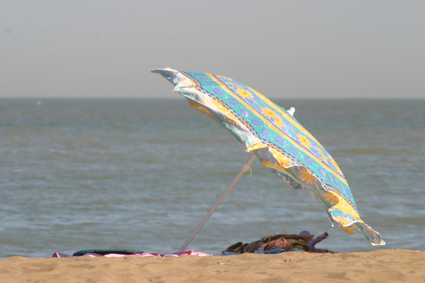 In part two of my series on the Isle of Thanet, situated on the East Kent coast, I visit the charming seaside town of Broadstairs. 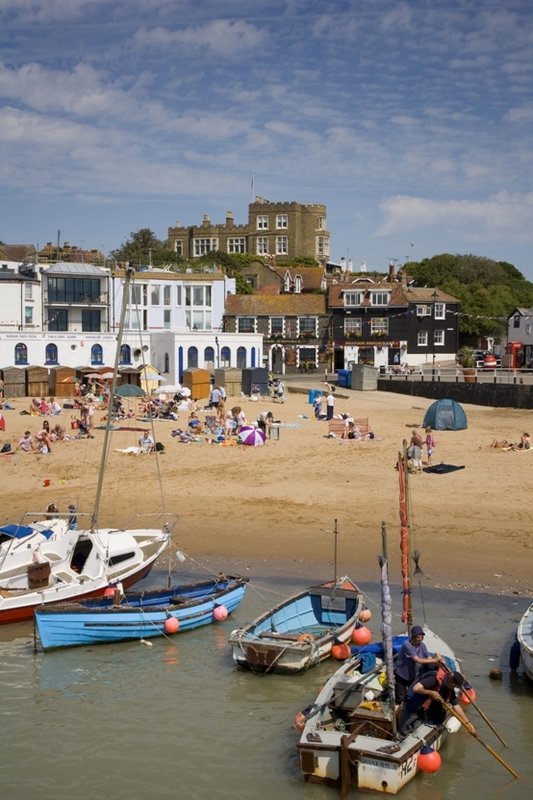 Whilst many of Britain’s seaside towns have suffered the blows of a dying tourism industry over the last four decades, Broadstairs remains untouched, the quintessential British seaside town, with one foot dipped in the past. 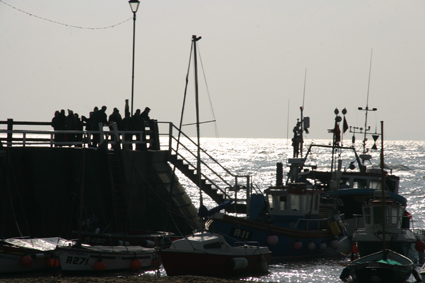 The town’s main beach, Viking Bay, forms a sweeping curve, embracing a tidal pool and children’s amusement rides on one side, and a picturesque harbour with bobbing fishing boats on the other. The bay is overlooked by a promenade, lined with gorgeous Georgian and Victorian buildings, now housing apartments, restaurants, bars and cafés. Take a leisurely stroll through the picturesque town and experience some of its Victorian charm. Dickens was a regular visitor, adopting it as ‘our English watering place’, and writing some of his greatest works there. 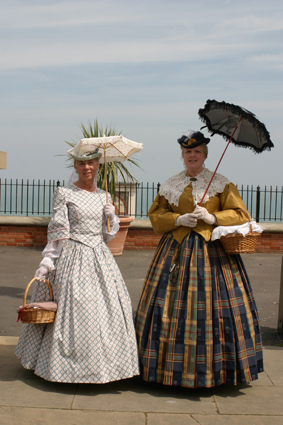 You can visit the Dickens House museum, where objects, letters and illustrations show the author’s association with Broadstairs. Follow the cobbled streets to Bleak House, used by Dickens as a holiday home, and you will come across Union Square, an area steeped in smuggling legend, and Church Square, where the extremely rare surviving wash houses are a reminder of the practice of washing dirty linen in public. 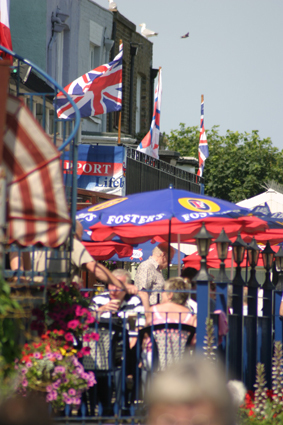 Wander along the promenade, stop off for a drink on the terrace of the Albion Hotel and take in the panoramic view of this charming seaside resort. For a nostalgic return to the heyday of the British seaside, make your way to the bandstand in Victoria Gardens, overlooking the sea, take a seat and catch one of the regular concerts that take place there. 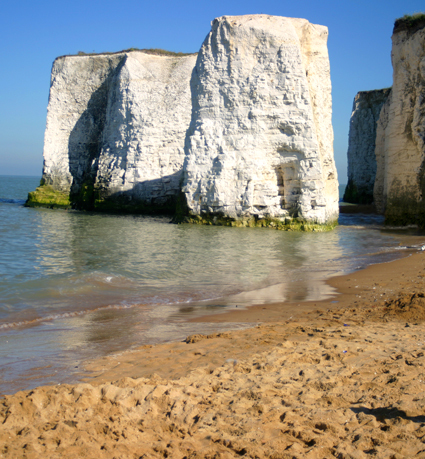 Meet the Rock Doc at one of Broadstairs’ glorious bays for a free one-hour walk of historical and geological discovery. The true gems of Thanet, these wide sandy beaches and flint layered chalk cliffs tell the story of our ancestral environment and hold clues to what the future might hold. Interpreting these for you, the charismatic Rock Doc, geological consultant to Hollywood, also pulls out magical items from his rock bag collection, and even shows you how to do your own coastal foraging. 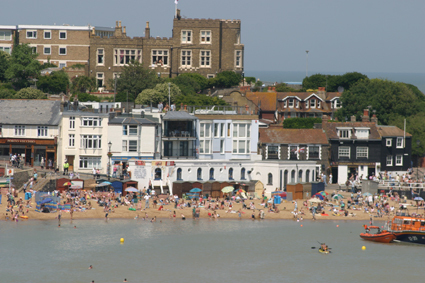 Even if guided tours are not your thing, this award-winning – and free – tour of St Peter’s village in Broadstairs is an experience not to be missed. Costumed characters from the past emerge from buildings, gardens and hidden corners and take you back in time: a black-robed monk greets you in the gloomy porch of the Saxon church, soldiers from the Napoleonic wars challenge you, Victorian workhouse masters tell you about life for the poor and the infamous smuggler, Joss Snelling boasts about his exploits. You’ll be taken to hidden lanes and squares, and historic buildings that you’d otherwise not find. St Peter’s Village tours take place from April to September on every Thursday and some Saturdays. 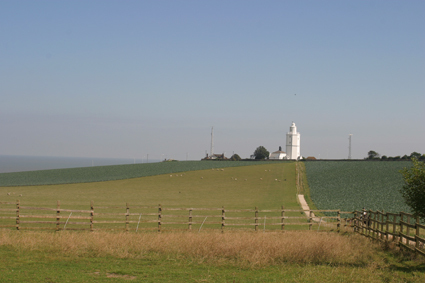 For more information: Call 07546 514948 or visit: www.villagetour.co.uk Though free, booking is essential. A year-round calendar of events celebrates the town’s diversity. The biggest of these is Folk Week in August. Now over 40 years old, this music festival brings people in from all over the world, giving the town a veritable party atmosphere. At the end of September, food lovers can indulge their taste buds at a three-day food festival, which takes place on the cliff top overlooking the sea. You’ll be able to wander from stall to stall, tasting specialities cooked up by local chefs and sampling regional produce. 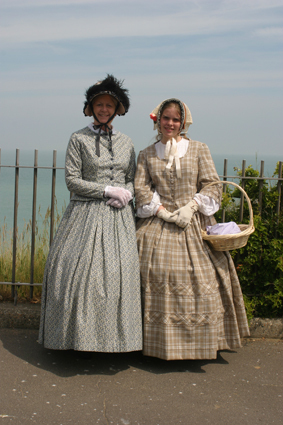 During Dickens Week in June, the town pays homage to its most famous visitor with costumed parades, plays and readings. There is lots more besides – a programme of live music on the bandstand, art on the beach, weekly fireworks over the bay through the summer and a water gala. 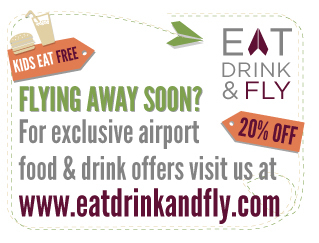 There are plenty of restaurants, bars and coffee shops from which to choose. For lunch, try Osteria Pizzeria Posillipo with its outdoor terrace overlooking Viking Bay. It is worth going to this popular Italian for the view alone, but be sure to book if you want an alfresco table. The classic Italian fare is standard, with the usual pizza, pasta, veal and chicken dishes on the predominantly Neapolitan menu, but the fish and seafood, mostly local, can be excellent. The daily specials bring a touch of flair and creativity to the table, and there is a good choice of Italian wines. It is a great spot for people watching too, and on a bright sunny day, you could be forgiven for thinking you’re on the Italian Riviera. 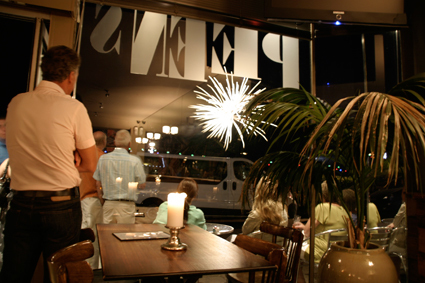 For dinner, or any time of day, Peen’s is a great place for good gastro grub. Sit at the splendid continental-style bar, and choose from the menu of modern British dishes large tiger prawns, garlic, chilli & lemon; char‐grilled 100% Kentish beef burger, caramelised onions, tomato relish, and fries), with the odd nod to Europe (marinated pork kebab, baba ganoush, tzatziki, homemade flatbread; fish stew with tiger prawns, mussels, squid, saffron and local seasonal white fish). The cuisine uses local produce, including seafood from the local crab man just two minutes down the road. 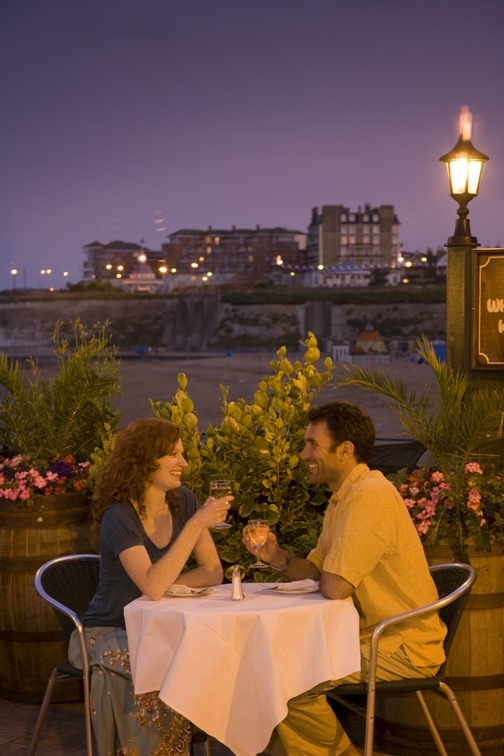 The wine list may not be the most adventurous but is probably one of the most extensive in Broadstairs and you might even find yourself tempted by the cocktails. Not to be missed is Morelli’s, a seafront stalwart and a rare example of the Italian ice cream parlours that appeared all over the British seaside in the 1930s and 40s. Its retro interior, which dates back to the 50s, has been preserved. You can sit on the pink Lloyd Loom chairs surrounded by pink formica, leatherette booths, a soda fountain and a juke box, and enjoy delicious fresh gelato, home-made to a signature family recipe using natural ingredients, at a fraction of the cost of its sister parlour in Harrod’s. For a unique experience, spend the night at Belvidere Place, a quirky and stylish boutique hotel, and enjoy the charming personal service of its owner Jilly Sharpe, who will also serve you a delicious breakfast of your choosing. If you prefer the anonymity of a hotel, try The Royal Albion Hotel, which has rooms with sea views. 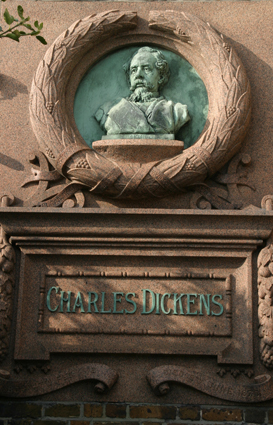 Charles Dickens stayed and wrote at the hotel on his many visits to the town. Broadstairs based Shop On Your Doorstep is an award winning retail website offering “gorgeous gifts, inspired interiors and terrific toys”. Don’t forget Helter Skelter Children’s Indoor Play Centre an alternative to the beach or an escape from the rain. 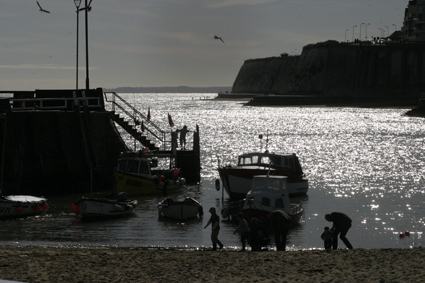 Named as Broadstairs’ No 1 attraction by Trip Advisor.